Inspiration can come from many places. For me it is often via making a connection between two separate areas. I wrote about this phenomenon in my earlier artcile, Synthesis. When two separate events occur simultaneously pertaining to the same object of inquiry we must always pay strict attention. The first occurrence was an article on Jeff Shuey’s blog entitled Surely, you must be joking. This borrows from the title of Nobel Laureate Richard P. Feynman‘s book Surely You’re Joking Mr. Feynman (as edited by his friend and co-drummer Ralph Leighton). I have found Feynman to be an inspirational character since I first saw him interviewed in depth on the BBC’s science magazine programme, Horizon. Some footage of this interview appears in the BBC’s archives, and may be viewed here. It is well worth a look. I happen to have recently referenced Feynman, albeit rather obliquely, in a review of my bogging experiences, New Adventures in Wi-Fi – Track 1: Blogging. I have been delighted to receive some messages from people saying that this article had prompted them to take up blogging themselves. There can surely be no greater compliment paid in social media and I am honoured to receive it. The idea for Jeff’s article came both from Microsoft featuring Feynman’s work on its Project Tuva site (this doesn’t seem to work for me in Chrome, though it’s fine in IE8 – maybe I’ll keep quiet about this in case the European Commission is listening in) and a subsequent exchange of tweets and links that we shared on twitter.com. Jeff’s handle is @jshuey if you would like to follow him. Also check out Jeff’s article to learn more about how a remarkable human being has influenced both him and Project Tuva. The second event relates to the traditional American diner that is round the corner from where I live. I appreciate that I live in London, but nevertheless I do have a traditional American diner round the corner. It is even owned by a Packers fan from Wisconsin. 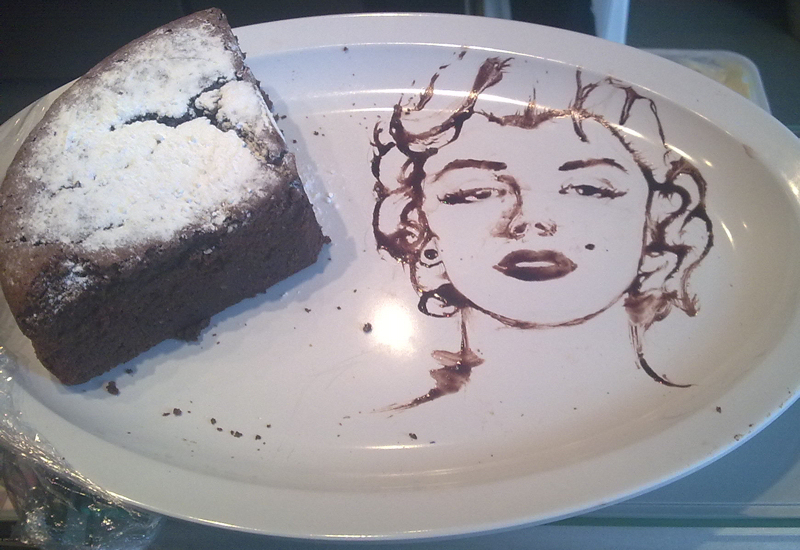 Lauren is one of the people who regularly works there and she has a talent for drawing in chocolate – no you haven’t misread that, she draws in chocolate, specifically on the plate that holds the diner’s very pleasant flourless chocolate cake. I’m really happy that my input has played a small part in two creative acts. This is particularly the case as I am normally acknowledging the inspiration that I have drawn from other people. This sort of give and take of ideas has of course been happening during the entire course of human history. Clearly, even if I live to be 100, I could never hope to be as inspirational or influential as Richard Feynman. However it is both gratifying and humbling to be able to take part in the cycle of human interaction, no matter how minor my role. Maybe these two small recent examples are further evidence that the pace is increasing. Just like to let you know that you were (and still are) a source of inspiration for me when I first started my own blog 4 months ago. By the way, I now can add another common point between us: Richard Feynman. I’ve learned about him through James Gleick biography, Genius, and come to appreciate his brand of humour. Thank you once again for your kind words and it is a small world isn’t it? Here are some more connections between the worlds of twitter, jornalism and BI. I’m a cycling nut and it is almost becoming standard that the journos use twitter as their primary source for up to date information from the riders/managers etc, you often see the stories being written up as ‘such and such said blah blah’ on their twitter feed. What I like about it is that we have journalism that is easily verified by the reader, the author cannot be misquoted! If only the same were true of BI (even that produced from an enterprise DWH): The report is run, the dashboard viewed but how difficult is it for the user to verify that what it is telling them is true! I’m talking of course about the lack of data lineage and how long it actually takes a user to drill to the actual detail in most state of the art BI tools. Thanks for the comment – so are you a roadie or MTBer? I refer to my work as Business Performance Coaching. I increase my clients’ effectiveness by thinking through their most burning issues with them and creating plans to get tangible, measurable and specific results.